Within the Basilic are the tombs of many kings and leading personages of France. Louis XVI and Marie Antoinette are buried in the crypt. If you want to see more gothique from France, just visit : https://pbase.com/ericdeparis/gothique_de_france that present some of my best shots from cathedrals of France. IMPORTANT : Prefer the "original size" (just below the image) to get the best resolution. IMPORTANT : Selectionez "original size" (sous les photos) pour une resolution optimale. Cést vrai que ici on peut demander l árbre genealogique des familles. Ma grandmere Jeane Brannens et Jean Camile Saunier. Je voudrais savoir, je lu a internet ca. Ils ont ne a Bourdeaux y Cannes. Merci beaucoup. C'est une eglise trés belle!! this is beautiful! merci beaucoup! Encore une magnifique série dans ta grande spécialité Eric!! Vote. 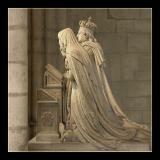 Saint Denis is for king and queens of France only. I believe that the piece for which you are looking (funeral bier with hooded monks) is actually to be found in the collections of the Louvre museum. I remember having seen this piece a few years ago, and it is also featured in a number of the guidebooks, as it is quite striking. The figures are all done in polychrome, and the effect is spectacular. I hope that this is of some help to you. 2 days ago we have been to the basilique Saint-Denis, 7 m north of Paris. Beautiful!! Beautiful photos. I still need a map to see exactly where St Denis is. I am looking for a Royal or noble tomb or bier that is supported by a series of hooded monks. The de Young family in San Francisco CA, had plaster casts of them done for the 1915 Pan American exhibition. They were then in the museum for many years... Any help?